Only seven weeks after giving birth, Katherine posted on Instagram that she was ready to get back in shape, and posted a snap of herself in a hilariously mismatched outfit! Katherine and her husband, Josh Kelley, who have been married since 2007, are also parents to two daughters, Adalaide, 4½, and Naleigh, 8. The family moved a rural Utah ranch in 2010, so that they could have more time for each other and live a more quiet lifestyle. Her 15 year old niece, Madison, also lives on their ranch so that she can focus on her equestrian activities. We know that this adorable little guy is going to be super spoiled being surrounded by all these gals! 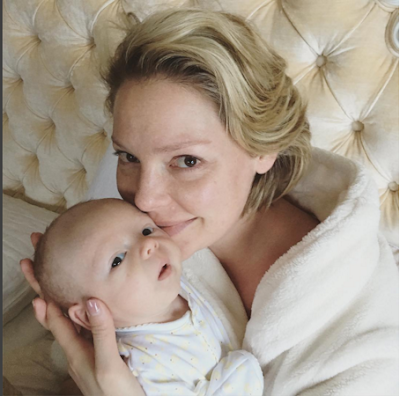 Heigl has said in the past that she loves being out in Utah on the ranch, because she can travel to LA to film or do promotional work when she needs to, and then she can travel back home and turn that part of her life “off”, and just be a wife and mom. Love that about her!